At the Data Collection Mode step of the wizard, choose the mode of collecting data from virtual infrastructure and Veeam Backup & Replication servers. Data collection mode determines what metrics Veeam ONE will collect, and specifies the product configuration in a number of areas. Choosing an appropriate data collection mode allows you to optimize monitoring and reporting performance and improve user experience in Veeam ONE. To learn the difference between the data collection modes, see Appendix B. Data Collection Modes. The Typical Deployment and Advanced Scalability Deployment modes are recommended for users who want to monitor and report on both the virtual environment and Veeam Backup & Replication infrastructure. Optimized for Typical Deployment mode is recommended for small to medium environments up to 100 hosts and 1500 VMs. In this mode, Veeam ONE collects all inventory, configuration and performance metrics, and makes collected data available in dashboards, reports and alarms. This mode provides the greatest data granularity level, but results in a greater load on the Veeam ONE server and a larger size of Veeam ONE database. Optimized for Advanced Scalability Deployment mode is recommended for large environments with more than 100 hosts and 1500 VMs. In this mode, Veeam ONE collects all metrics required for alarms and reports. This mode provides a lesser data granularity level than the Typical Deployment mode, and results in a lower load on the Veeam ONE server and a smaller size of the Veeam ONE database. The Backup Data Only mode is recommended for users who want to focus on Veeam Backup & Replication monitoring and reporting, and do not need a deep visibility of the virtual infrastructure. In this mode, Veeam ONE collects all inventory, configuration and performance metrics from Veeam Backup & Replication servers. It also collects inventory and configuration metrics from virtual infrastructure servers, but skips virtual infrastructure performance metrics. As a result, Veeam ONE dashboards, reports and alarms display backup-related data only; for VMware vSphere and Microsoft Hyper-V objects, performance data is not available. 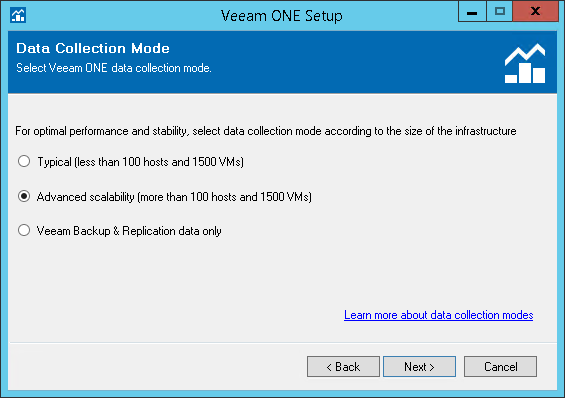 This mode results in the least possible size of the Veeam ONE database and the lowest load on the Veeam ONE server.